Great interview with Ivy Slater, talking about overcoming money fears. So many women entrepreneurs run into this, where they are stuck because they are afraid to charge what they are worth, or they view asking for money as something that doesn’t agree with being a Nurturer and being of service. Ivy gives some very effective perspectives on how to get past that. Minette and I both saw a lot of similarity between Ivy’s story and Minette’s, and their shared obsession with Staples, supplies, pens, and especially sticky notes. For the second episode in a row we talked about Hunters and Gatherers (see Episode 11: Kimi Avary) … I guess that’s becoming a theme! No reason we have to be alone in business. No one said we had to do it by ourselves. Seek out mentors, coaches, community to support you. Wondering why your business isn’t growing. Think about what you are consistently doing and not doing in your business in your business. Consistency is the secret to success. Need a mindset shift? Ask your clients for testimonials. Read out loud to yourself when you get up in the morning ad before you go to bed at night. Ivy would love to gift ROI her complimentary report on Return on Your Initiative the 5 Steps to More Sales and More Money in Your Life. Visit​ ​Slatersuccesscoaching.com/roi​ ​to receive this free gift. 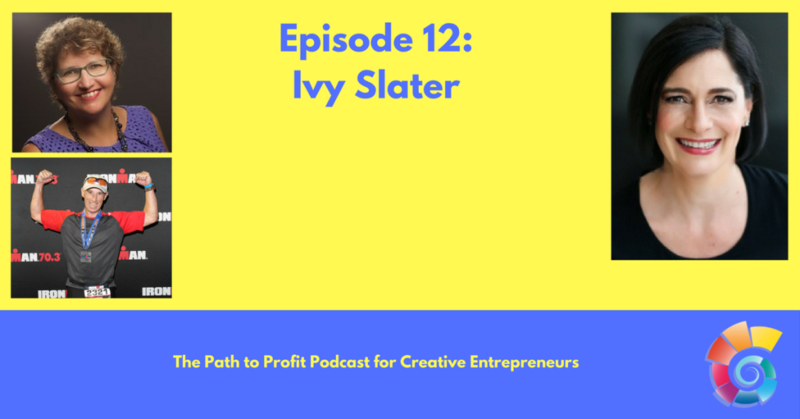 Ivy Slater is CEO of Slater Success Coaching, where she works with smart and ambitious female entrepreneurs to design profitable service based businesses. For the past 10 years Ivy has worked with hundreds of entrepreneurs, helping them step into their value as leaders in business and create their desired lifestyle. Ivy is a wife of 30 years​ ​and mother of two adult children. When working with her clients encourages family first and then business. Ivy built and grew her businesses while raising her two children, being class parent, Vice President of the PTA, and organized various school functions. Ivy’s experience includes owning a 7­figure printing business, in New York City. Slater Graphics made a positive impact in the industry by creating a niche market for women buyers. Ivy is passionate about getting women out of their own way to create success on their terms. As a nationally recognized speaker, trainer, and author Ivy has been featured on stages across the country. Her book is ​Conquer Your Fear of Money: A Women’​ s Guide to Business Success, where she shares proven systems used in building her businesses. ← Is Perfectionism Killing Your Business?